PURCELL G. SCHUBE, M.D. ; M. C. McMANAMY, M.D. ; C. E. TRAPP, M.D. ; et al G. F. HOUSER, M.D. Although the psychoses starting during the period of involution were recognized and their relationship to this period was declared, it was not until 1896 that Kraepelin1 definitely described melancholia and classified it as an involutional or a retrograde presenile process (das Irresein des Rückbildungsalters). In 1899 he2 described it as a distinct entity occurring in the involutional period of life and as more frequently present in women than in men. This concept, with insignificant variations, has stood since, in spite of the repeated attacks, starting with those of Thalbitzer,3 in 1905, and of Dreyfus,4 in 1907, which have been directed against it. 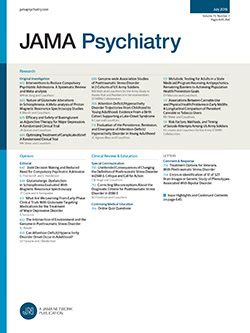 Recently, the concept of involutional melancholia has been more firmly established by the clinical experience of Noyes,5 who pointed out that persons showing an involutional psychosis have personalities the outstanding characteristics of which are inhibition, seriousness, rigidity, overconscientiousness and no sense of humor.